The Jacuzzi bathtub will upgrade a bathroom and will add value to your home. You also get a good return by selling your home. There is also more in the installation process other than pulling out old tub and then putting new Jacuzzi bathtub. These steps are to install the Jacuzzi bathtub. First make sure that floor is leveled and also you can support weight. If floor is uneven then you have to fix area such that tub sits on level. Else, you will be in trouble with water being not able to drain them properly also it may affect ability of jets to function well. Your floor will need the ability to support at least some 150 lbs per square feet. In case if it is not possible, you have to add some support below floor. 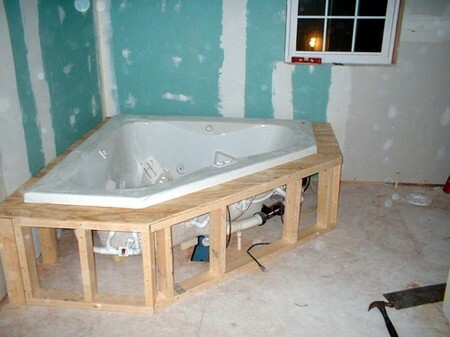 Secondly, frame the area needed to support Jacuzzi bathtub. Jacuzzi bathtub will need to be supported with a full length of bottom of bathtub then the rim. One access panel which is 18 inches into 18 inches will help you to reach pump or a motor in case of trouble and will provide necessary ventilation. Then plan enough room in order to inspect Jacuzzi bath tub through access panel during problems. Then set Jacuzzi bathtub in to the framework. Use the level in ensuring that bathtub is in level from front towards back and along with side to side. In case it is not in level then put shims below tub until it becomes level. Secure bathtub to framework with sheetrock nailing flanges. Connect wire with plumbing for Jacuzzi tub. This warranty on tub might be voided if not properly connected to bathtub. The bathtub should be grounded perfectly in order to prevent the electrical shock. Terminal compartment box must have the diagram for a proper wiring. You might wish to hire the licensed professionals in ensuring these are to be done perfectly. Clean whole construction area in order to remove any residue or debris. Also check that all the connections and the fittings are all secured. Fill in the tub such that water level is just above the jets and then check for any leaks. Turn on jets and then allow bathtub to run out for at least some 15 minutes. Then fix any problems that you see before close in that area. Use the sheetrock to cover framework. You can also paint sheetrock or apply the tile. If you are planning to use the tile find if the floor supports the additional weight. You may use the caulk around edges of Jacuzzi tub to help preventing the water leaks.